Councilors may determine today how many borrowing plans to put before voters, and it could be three or none at all. Portland city councilors are expected to vote Monday night on what kind of elementary school bond package to put before voters: A $64 million bond to renovate four elementary schools? A $32 million bond to fix two of the schools and seek state money for the other two? Or a $24 million bond that would mostly pay for upgrades at a single school? They might decide to put all three options before voters – or none at all. The meeting begins at 5 p.m. in Council Chambers at City Hall. Despite the dueling proposals, decades of discussions and millions of dollars spent studying the schools, council and Board of Education members agree that all four schools – Reiche, Longfellow, Lyseth and Presumpscot – need to be renovated as soon as possible. The current options are scaled down from an initial $70 million proposal endorsed 6-2 by the school board last year. An ad hoc committee made up of council and board members lowered it to $61 million by making new gyms smaller, eliminating locker rooms, removing second floors at Lyseth and Presumpscot, and cutting playground upgrades. The council’s finance committee added back some items that had been shifted to the capital improvement project list, for a final bond proposal of $64 million. The schools have not had significant investments since they were built 40 to 60 years ago. Basic maintenance has been put off in most cases, usually because of budget concerns, just like officials are talking about today. The deferred maintenance sometimes led to significant problems, such as holes opening up in a Reiche walkway, bricks falling off Longfellow, and a leaky roof at Lyseth. At any amount, the bonds being discussed mostly address basic health and safety issues, such as installing functional heating and windows that open, providing handicapped access where needed, eliminating use of trailers for classrooms and reconfiguring existing space to ease severe overcrowding. Critics focused on better test scores have argued that nice buildings don’t help students learn better. But studies show that they do, and in some schools learning doesn’t happen at all because of space limitations. At Lyseth, for example, the rooms are too small to legally house a pre-kindergarten class under state law. At Presumpscot, the school community cannot gather for student performances or the annual fifth-grade send-off celebration because the gymnasium, which doubles as the cafeteria, is too small. Lyseth’s pre-K program is housed at Portland Arts & Technology School, a mile and a half away. But that means those students don’t meet the Lyseth teachers or see the elementary schoolchildren there, said Principal Lenore Williams. Just as important, educators say, is that the buildings aren’t designed for today’s connected, project-based and collaborative education models. There aren’t enough outlets to plug in computers. 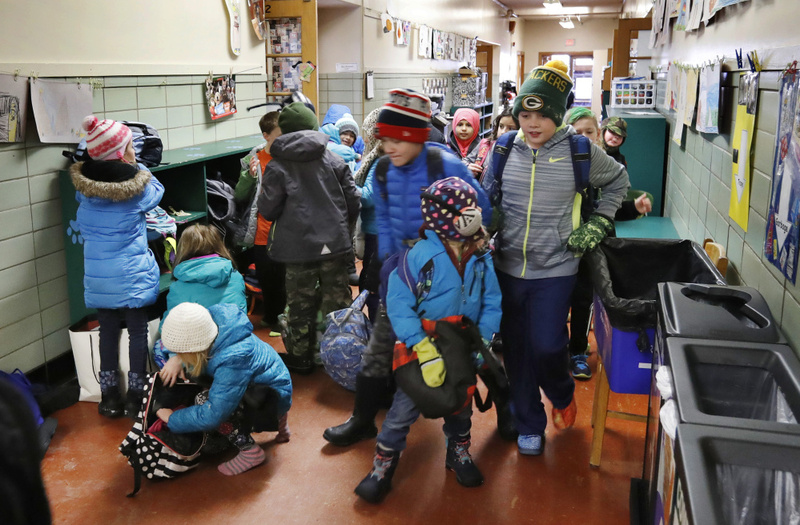 Classrooms are crowded, and in some cases there isn’t room for children’s winter gear and backpacks, so “cubbies” – or cubicles – are in the hallways. As special education populations have increased, more education specialists are required in the buildings for physical and occupational therapy, or more office space for a social worker or a gifted and talented instructor. Storage and janitorial closets have been transformed into office space, with janitorial equipment ending up in hallways. The space crunch can also make it hard for some students to learn. One-on-one help for struggling students happens in hallways, next to photocopiers, janitorial equipment and kids walking by on their way to the bathroom. Biggest complaint: Combined gym-cafeteria space. “If we could get nothing else done, we have to convert our gym into a cafeteria,” Williams said. “It hamstrings us.” That’s because there are three lunch periods, and during that time no physical education can take place. Plus the gym is the only place big enough for the entire school community to gather, so it’s in high demand. On a normal school day, it’s chaotic as students come in and out from class and recess to eat lunch, Williams said. After the last of three lunch periods, the custodial staff uses a Zamboni-like device to clean the floor. It’s not uncommon, Williams said, to see the kids who have physical education that period waiting in the doorway for the floor to dry so they can go inside. • Add a new gym. • Eliminate modular classrooms, currently used for English language learners; add classroom space, including pre-K and gifted and talented; create bigger space for art, music, the library, nurse’s station and a social worker. Currently the gifted and talented space is in an alcove that is actually a short hallway to the outside. The fire department has grandfathered in the arrangement, even though it blocks an exit. Biggest complaint: Noise. Reiche has an open-concept floor plan, with no walls between the classrooms. Some teachers have bought noise-canceling headphones for students. “It completely cramps how you can teach and it makes it really hard for the kids to concentrate,” said Christine Keegan, one of three lead teachers in the building. • Enclose classroom corridor walls and provide operable partitions, and make other acoustic and lighting improvements. The money would also create rooms for pre-K and health care, in addition to special services. Currently, occupational therapy and physical therapy take place in a one-time utility room, with no natural light and pipes running along the walls, Keegan said. Another problem room is the music room, she said, where a wall of windows with southern exposure sends the temperature soaring into the 90s even on a winter day, and the door going outside can’t be opened for security reasons. “Using technology in the rooms is very challenging because you don’t have walls to run wire, so you have a lot of mess on the floors,” she said. Keegan said almost all the proposed upgrades at Reiche would directly affect student learning, not just make infrastructure improvements. “This would really impact the experience the kids have,” she said. Principal Terry Young says the cluttered, narrow hallways of Longfellow are an outward sign of the cramped space throughout the building. “This is an issue every year with the fire department,” said Young, looking down the school’s long hallway. Along the walls, in addition to student cubbies and desks and chairs for one-on-one instruction, there are copying machines, large locked computer storage carts, industrial floor buffers, rows of garbage and recycling bins, and folded-up tables that get rolled into the gym at lunchtime. There is no elevator to the basement or the second floor, so janitorial equipment can’t be stored there – let alone allow handicapped access to those areas. There isn’t any kitchen space, so temporary heating units arrive with meals and are set up in the hallway. Renovations would include a new gym; compliance with the Americans with Disabilities Act; full asbestos abatement; improved security; bigger rooms for reading, English language learners, gifted and talented programs, music and art; as well as more library and kitchen space. In the combined gym-cafeteria, gym equipment is stashed on the stage, which also houses the desk and office space for the physical education teacher, so the stage can’t be used for presentations or performances. Young said his top priorities for basic repairs would be working windows in every classroom, more than two electrical outlets per classroom, and heat that consistently works. About 30 to 50 windows are permanently jammed shut, he said, and most classrooms use extension cords and outlet strips to meet their needs. Biggest complaint: Modular classrooms are mentioned most often in meetings, but Principal Cynthia Loring says she can’t pick one problem over another. The common thread at Presumpscot, she said, is space. “Space is a hot commodity,” said Loring, noting that the library can’t accommodate more than 20 students at a time, and that Presumpscot has the same combination gym-cafeteria problem as the other elementary schools. “Every single space is a multi-use space,” she said. The school has three portable classrooms – which lack plumbing – that have been used for second-, third- and fourth-graders since 2006. On a tour, one of the trailers had missing blinds and a light that hasn’t worked since water damage two years ago. A strip of wood in the center of the ceiling was hanging down and there were carpenter ants in the ceiling. The music room and the art room are in the same space, and when it’s needed for both uses at the same time, the school closes the library so it can be a temporary class space. Loring said that if teachers are gathering for professional development and the library is in use, they squeeze into the staff lunchroom. “It’s constant juggling,” Loring said. • Adding a gym; improving security; adding over 9,000 square feet of classroom space; and providing more room for occupational therapy, physical therapy, English language learners, music and art, as well as library, kitchen and restroom space.